The crisis in Venezuela has recently garnered international attention due to the international recognition of Juan Guaido as the interim President of the country, along with the waves of massive protests against sitting president Nicolas Maduro. The ongoing crisis has culminated in the crumbling of the country’s democracy as a call-to-action from the international community takes effect. This event has sparked discussion amongst international onlookers, with some applauding the temporary change while others accuse the United States of advancing their political agenda by eliminating sources of anti-U.S rhetoric to favour American commercial and political interests. Governments around the world have positioned themselves either in support of Maduro or in line with the United States and the Lima Group. However, the debate isn’t so simple. Without question, millions of Venezuelans have been made victims of the Maduro regime and need a government that will restore economic and political stability. But the United States is no stranger to Latin American politics. Supporting repressive dictatorships in order to benefit from the region’s natural resources have been the common thread in U.S–Latin American relations. Venezuela needs an urgent change in leadership, but American intervention may potentially exacerbate the crisis. Since inheriting the presidency in 2013, Maduro has faced substantial backlash both within and outside of Venezuela. Following hyperinflation, widespread shortages, and staggering unemployment, the Venezuelan crisis reached its peak and thousands marched in protest to Nicolas Maduro’s second inauguration as President of Venezuela in January. U.S National Security Advisor John Bolton has referred to the state as an “illegitimate dictatorship”, while some countries such as Paraguay have broken diplomatic ties. In 2017, the international community criticized the legitimacy of Maduro’s re-election to another six-year term amid the economic crisis. Following a series of ongoing sanctions in response to his reelection, the United States issued new sanctions to prohibit Venezuelan officials from selling public assets. This only marks the continuing trend of U.S-imposed sanctions on the country, which were first sparked by Hugo Chavez’s government. Since Chavez’s nationalist government came into power in 1999, tensions rose as he promoted anti-imperialist and nationalist policies, which persisted under Maduro. The Chavismo era reflected a sharp change in policies, introducing nationalization measures, social welfare programs, and strong opposition to American imperialism. Chavez was a controversial figure who was strongly criticized for driving the country into further poverty and corruption by some, while others supported his social policies that aimed to redress the grievances of the poor. In 2002, he accused the United States of launching a coup against him as he took greater control over the national oil company. After forty-eight hours, he returned to power, which marked the beginning of the fallout in U.S-Venezuela relations. Increasingly, Chavez sought support from other socialist regimes, exacerbating tensions with the United States. After Chavez’s death, Maduro won the presidential elections by a small margin in 2013 and continued Chavismo politics while maintaining alliances with opponents of the US. Washington’s support for Guaido isn’t a surprising development considering that he is a member of Voluntad Popular, a party that was founded in direct opposition to Chavez’s socialist party. Consequently, Venezuela is of primary interest to the United States as one of the few socialist regimes in Latin America and one of the largest sources of oil in the world. In 2018, American refining companies imported 500 013 barrels per day, the largest buyers of Venezuelan petroleum from state-owned oil company Petróleos de Venezuela, SA (PDVSA). Furthermore, the Trump administration recently announced sanctions against the oil company to oust Maduro and “return the money to the people” by redirecting the resources to Guaido. In response, Guaido expressed his plans to allow the private sector a stake in PDVSA to increase oil production and pay back debts. Ultimately, the interests of the United States lie in eliminating an ally of socialist regimes, regaining control of the oil market, and putting an end to a destabilizing force in the Americas. The respect for human rights and the alleviation of poverty are pretexts used to gain support from international and domestic actors. Rather, the United States’ involvement reflects the Monroe Doctrine and the Roosevelt Corollary, which were both components of American foreign policy used to justify thwarting socialist influence during the Cold War and assert the US’ role as the “international police.” The crisis in Venezuela presents an opportunity to reiterate this imperialist strategy and put an end to the rule of a rebelling government. As the crisis has created a mass exodus of migrants toward the United States, many have been detained at the border. Former Chavez advisors have turned their back on Maduro as well, but don’t believe external intervention is the solution. Meanwhile, controversial figure Elliott Abrams was named Special Envoy for Venezuela. 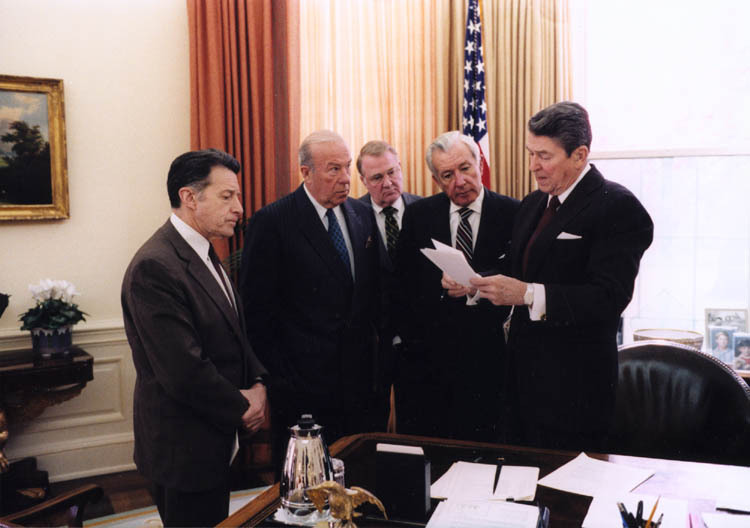 Because of Abrams’ involvement in the Iran-Contra affair, where the Reagan administration funded right-wing terrorist groups in Central America, it is unclear whether or not this intervention will have a positive effect on the country. Past experiences suggests the United States does not have the Venezuelan people’s interest at heart, but instead seeks to establish a government that will be favourable to its own interests.